Bennett Konesni grew up in Appleton, Maine, 10 miles downstream of Maine Fiddle Camp. He was naturally drawn into the strong communities of old-time music, sailing, and farming in the area. At thirteen he shipped as a deckhand aboard local schooners, sailing Penobscot Bay and learning the traditional work songs of the tall ships as he raised sails and hauled anchor. Later, at Middlebury College, Bennett co-founded the student farm and spent six months studying Zulu farming songs in South Africa. He was awarded a Thomas J Watson fellowship to spend a postgraduate year in Tanzania, Ghana, Mongolia, Vietnam, Switzerland, and Holland studying worksongs of sea, field and steppe. 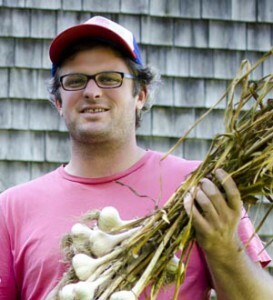 More recently Bennett co-founded Sylvester Manor, a 243-acre educational farm on Shelter Island, NY. In addition to long-range strategic planning and outreach for the organization, his roles include teaching worksongs to the farm crew and directing the annual fall festival “Plant & Sing”, which brings the community to the farm to complete two week’s worth of garlic shucking and planting in a single morning, all while singing. Bennett has given a Ted talk about his work, and speaks, teaches, and performs regularly throughout North America individually and as parts of several bands. He is the curator of worksongs.org and is starting this summer a project to collect, explore and share worksongs from all over the world via the internet. He and his wife Edith are building a homestead of their own in Belfast, Maine.